Vancouver Mayor Gregor Robertson not seeking re-election. 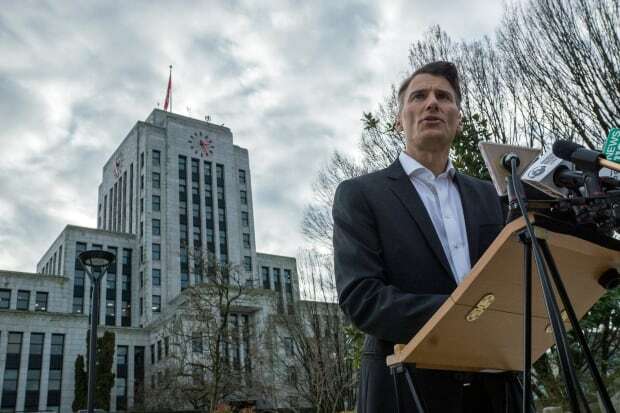 In what he called “one of the hardest decisions of [his] life,” Vancouver Mayor Gregor Robertson has announced he will not run for re-election on Oct. 20. Robertson, 53, said the decision was “intensely personal” and that he would not remain in politics in any capacity: municipal, provincial or federal. He said he had no concrete plans for when his term ends at the end of October. Robertson was first elected mayor in 2008 after serving as MLA for Vancouver-Fairview with the provincial NDP. He was re-elected mayor in 2011 and 2014, leading a Vision Vancouver slate at city hall. He said his biggest achievement in office has been helping make Vancouver a green, livable and prosperous city admired around the globe. “I will leave the place a lot stronger than when we came in and that’s important. That said, we still haven’t solved everything.” the mayor said, citing affordable housing and transit as two priorities. As recently as October, Robertson had told reporters that he did plan to run again. Robertson has faced numerous challenges during his time as mayor. One of those has been housing affordability. The mayor had vowed to end street homelessness by 2015, but the numbers have increased over the last decade. However, Robertson said he doesn’t regret setting that goal. “It’s frustrating that we didn’t get there,” he said. “I think we’ve done more than any city in Canada for homelessness and affordable housing but we’ve got to keep doing more.”Robertson became emotional when he spoke about what he considered to be his biggest regret over the last 10 years. “I regret not spending enough time with family and friends. That’s what I grappled with over the holidays,” he said. “Being in politics is a challenging lifestyle. My youngest daughter just had her college graduation, but for a lot of her high school school years I wasn’t there.” Had he won the upcoming municipal election, he would have eclipsed Philip Owen as the only person to win four consecutive terms as mayor in the city’s modern era. Robertson also would have surpassed Louis D. Taylor as the city’s longest-serving mayor during his term. “It’s been the greatest honour of my life to serve this extraordinary city and help make Vancouver an inspiration to people and cities around the world,” Robertson wrote in a Facebook post Wednesday.